Acacia leprosa ‘Scarlet Blaze’ is a quite remarkable plant. For most people, the acacias or wattles (sometimes also erroneously known as mismosas) are recognisable by their cream or yellow-coloured flowers. Therefore it might come as a surprise seeing this cultivar in bloom as it displays crimson red flowers, which is unique among the wattles. ‘Scarlet Blaze’ is quite a recent discovery and arose from a single red-flowered specimen discovered by bushwalkers in a state forest north east of Melbourne, Australia, in 1995. Upon discovery, 12 cuttings were removed of which only two survived, which was just as well because the original plant has since died. It was from these two cuttings that thousands of plants would eventually be produced. 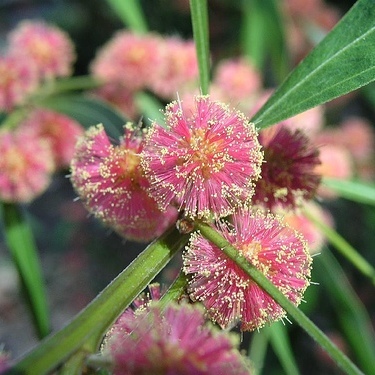 Acacia leprosa ‘Scarlet Blaze’ is a medium to tall shrub or small tree with an erect or weeping habit. The flower clusters are globular in shape and in pairs. To maintain their crimson-red colour this plant needs to be propagated by cuttings, when grown from seed the red colouring reverts to the more traditional yellow flower.